Food Resources – Bulldog Bags, Inc. The Celiac and Allergy Friendly Food Initiative is a non-profit organization established by two Stow, OH residents that helps people with limited monetary resources to access special, allergy-friendly food. Check the website for more information and their Facebook page for food distribution dates. All children ages 1 through 18 are eligible to receive free meals during the summer months at participating program sites. Individuals ages 19 through 21 who have been identified as having mental or physical disabilities and are following Individualized Education Programs (IEPs) through their current enrollment in educational programs, also, are eligibble for free summer meals. Although there are no SFSP sites in Stow, there are sites in surrounding communities. You can check to find a SFSP for your child(ren) that would be most convenient for you. FIND A PROGRAM SITE or call 1-866-348-6479. 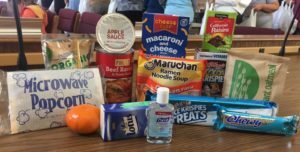 Akron-Canton Regional Food Bank has a number of different resources for food, including full service food pantries. You can, also, call 855-560-0850. InfoLine 211, also, has a number of different resources for food, including food pantires. You can, also, call 330-376-6660 or just dial 211.